Hi there, A few weeks ago while we were camping in Stonelick Park I painted this. Campgrounds look pretty much the same and it can be challenging to find something I want to paint sometimes. I always like to get out if possible and try a little plein air and we were lucky enough to be camping by the lake and right across from this scene. I loved the red canoe and the little blue kayaks were glowing in the sun. This is acrylic on a 8 x 10 museum quality Raymar panel.. Email me anytime you see something posted you might be interested in purchasing. As you can see I added a buy now button to this, you can purchase it through paypal for $75 and free shipping within the continental US. Hello sweet visitors to my blog, today for your viewing pleasure I have a painting of poppies yet again, lol I'm being silly, sorry. This is acrylic on a 8 x 10 stretched canvas. I really tried to keep this painterly and let the brushstrokes show. I wanted to suggest the distant poppies and make the closer ones a bit more detailed. Thank you so much for visiting and I hope you are having a wonderful day. Hi there, This painting is a mixed media piece. I started with patterned acid free paper which I proceeded to cover up, lol I added the pears and then felt it needed something else and completed it with the stenciled pattern. I am going to frame it in a copper frame and there are copper touches in the pears. This is painted on a 11" x 14" stretched canvas. 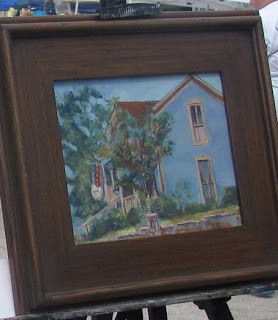 This Saturday I will be in Waynesville Ohio painting in a plein air event assuming we don't get rained out. Saturday night is Second Saturday at Gallery 42 also from 5-9. I'll be there too if I have any energy left. Gallery 42 is in Mason Ohio, stop by. Have a good day! Hello there, I painted this on three 10"x 30" deep panels, so it measures 30" x 30" tightly together. In the cropped shot you can see some of the raised designs that are in the painting. This is painted in acrylics. These are the 1 1/2" deep canvases so they will not be framed. I will be taking these over to the Pendragon model home in August when we change out and freshen the art. I'm open to name suggestions if you have any, you know how I struggle with names. Fantastic weather here lately and I should be out painting, next Saturday I do plan to attend a plein air event in Waynesville Ohio. Waynesville is a very old historic town, stop by then if you are in the area. Have a wonderful day friends.